To commemorate Open Data Day on March 3rd, Crowd2Map and Humanitarian OpenStreetMap Team Tanzania organised a free 3 day training conference on how Open Data and Mapping using OpenStreetMap can aid development in Tanzania. Over 90 people from across Tanzania attended the event at the Institute of Rural Development Planning in Mwanza, including community mapping groups from Kigoma, Kagera, Mara and other regions, students from IRDP Mwanza and Dodoma, as well as representatives from Tanzania Red Cross, Tanzania Wildlife Service, Uwezo and many other organisations. The training was delivered by Amelia Hunt and Johannes Peters from HOT and covered topics such as what open data is available in Tanzania, what is OpenStreetMap and how it can help Tanzania; how to map your area using satellite images on a laptop; free apps on your phone; and printed Field Papers; and how to create printed village and district level maps. There were a combination of demonstrations, talks and practical workshops, including a session mapping in the field in the area around the campus. Community groups who have benefited from phones and laptops provided by a HOT Microgrant and the Nethope Device Challenge programme learnt how to make the best use of this technology to put their communities on the map for better navigation, planning and development of their areas. 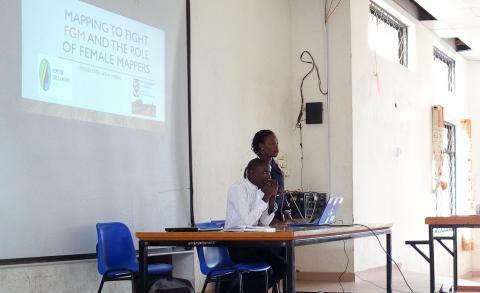 There were also talks by Jonarda Ngissa from Uwezo Tanzania on their citizen led educational assessments, and from Neema Meremo from Hope for Girls and Women Tanzania on how mapping can help protect girls from Female Genital Mutilation. Evaluations showed that people had learnt a great deal from the training and comments included “it will help me be a better planner for my country”, “now I can teach others to improve our development” and “mapping is useful to indicate which water points are functioning, so we can improve access in Tanzania”. Everyone indicated they would like further such training, and so we hope that many will be able to attend FOSS4G and HOT conference in Dar es Salaam in August.